Ravello InceptionSX earns high praise from Modern Infrastructure readers for its ability to run VMware ESXi hypervisors in the public cloud. Along with bridging the gap between VMware and leading public cloud platforms like AWS and Google, InceptionSX provides a solid development and testing environment, and can also be used with production workloads, MI readers wrote. 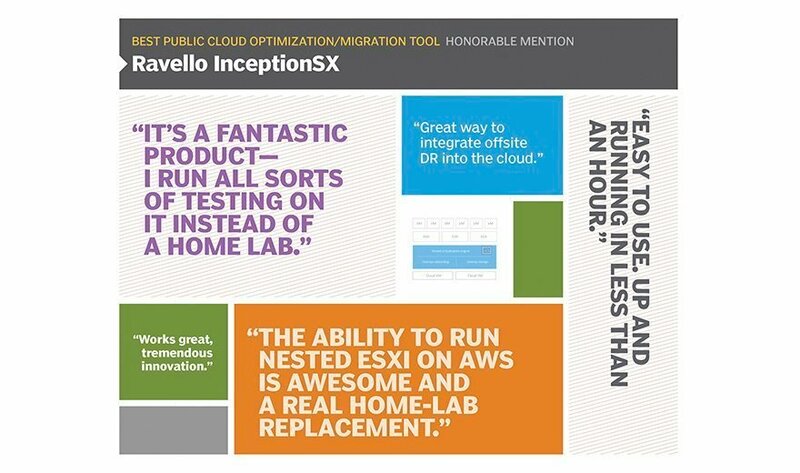 "The ability to run nested ESXi on AWS is awesome, and a real home-lab replacement," one wrote. Readers also applauded the tool for its easy set-up and intuitive interface. "It's definitely a very cool technical achievement," said Jirah Cox, sales engineer at eGroup, a VMware partner and reseller based in Mt. Pleasant, South Carolina. "No doubt there." Do you run nested ESXi on AWS?